'The 2016 Marrakech Biennale has rekindled much of the faith in and passion for art as it is presented in international exhibitions that I have lost in recent years'. 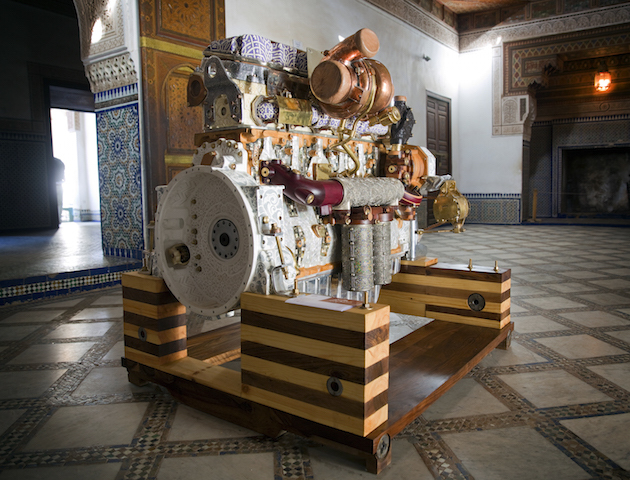 Nicola Gray writes about the 6th Marrakech Biennale (24 February - 8 May 2016). I will make a bold claim: the 2016 Marrakech Biennale has rekindled much of the faith in and passion for art as it is presented in international exhibitions that I have lost in recent years. There may have been other biennales and large exhibitions which might have evoked a similar response (it is not possible to see all of them), but some jaded emotions settled in for me some time ago as I began to witness many of the machinations of the art world and its attendant markets. Perhaps most painful for me has been the all-too-frequent mangling and misuse of words and language, and through that of clarity of thought and meaning. Clarity of thought is essential for an ethical consideration of anything, and curator Reem Fadda has thought clearly and expansively about this 6th Marrakech Biennale. It is brave and ambitious and does not waste exhibition or page space with any superficial trends or theories. Conceived of as a ‘living essay’, to quote Fadda, with a beginning and a series of movements through it, the Biennale weaves itself into parts of the fascinating fabric of this Moroccan city almost as if it had always been there. There is none of the superficiality of inviting ‘international’ artists to ‘engage with Morocco’. Neither is there the usual roster of names. A few are familiar; I suspect many will not be. Taken as a whole, the Biennale questions and provokes. It has three titles, in French, Arabic and English, each with their own subtle meaning as direct translations from language to language are always a little slippery. لا جديد الآن in Arabic, the French ‘Quoi de neuf là’ suggests the more colloquial ‘what’s new?’ than ‘Not New Now’ used for the official title in English. Whatever the subtle differences, the titles propose an alternative engagement with modernity, with what has been and still is, with continuities rather than ruptures, with where different histories have led. They propose a reconsideration of modernism and its legacies, a questioning of perspectives on it, of what is understood by it, and by whom. Although I like the colloquial ring of ‘what’s new?’, it is the ‘now’ that is crucial for Fadda. It is ‘now’ that matters, she suggests, and the histories that are folded into the now, and it is now when action is required. This Biennale is a provocation to think differently and enter into new dialogues, to question the term ‘contemporary’ and, I would also add, any glib usage of the term ‘globalisation’. In a redefinition of tired terminologies, Fadda proposes that instead of ‘contemporary art’, in this Biennale at least it is rephrased as ‘living art’. Informed by modern histories, and experiences of colonialism, threads related to this history can be traced throughout the Biennale. ‘Africa’ is one of the main ones (the Biennale logo is a clever graphic design of the continent’s shape). 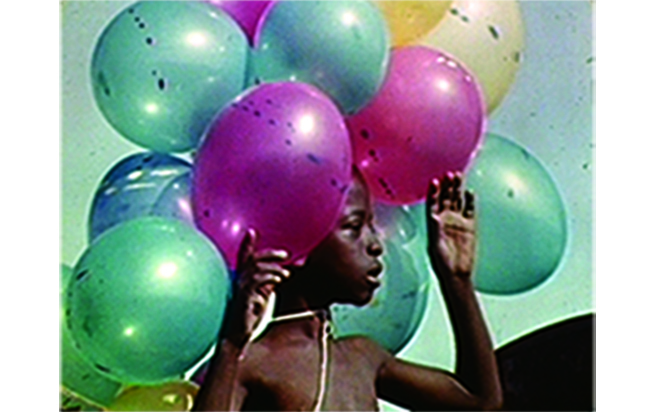 The huge complexities of pre- and post-colonial Africa, its political and cultural expressions, thread through many of the artists and their works – from Manthia Diawara’s 52 minute film Negritude: a Dialogue between Wole Soyinka and Senghor (2015)2 through the Senegalese Djibril Diop Mambéty’s small but immensely powerful output of fictional-realist films that he made before his early death in 1988, to the young South African Dineo Seshee Bopape’s beautiful installation, The name of which escapes me now (in its whole as well as in numerous specific places). Bopape’s multisensorial installation with its soil and crystals from across the continent presented like crucible offerings is a poetic evocation of Africa in all its diversity. Also working in film, Talal Afifi’s work in founding the Sudanese Film Factory with its mission to train and enable young people in documentary film-making is represented by three short films he produced (by Areej Zarrouq, Mohamed Subahi and Mario Mabor Dhalbny), which focus on Sudanese life and culture, particularly its musical traditions. The political histories of independence movements in Africa and the nationalist struggles of the mid-twentieth century also run through The Otolith Group’s essay film In the Year of the Quiet Sun (2013). The still images of Ghanaian stamps and scenes from the newly independent African countries show them at a particular period in their histories as they rapidly negotiate becoming ‘modern’ nations. We are then brought up-to-date with the current legacies of colonialism through the Danish collective SUPERFLEX’s video, Kwassa Kwassa (2015), a sensitively (and beautifully) filmed and edited work exploring the anomaly of Mayotte, one of the Comoro Islands between Mozambique and Madagascar. Mayotte decided in 2014 to revert decolonisation and return to being a colony of France, with the result that it became a distant part of Europe and therefore a destination for those seeking to emigrate or claim asylum. Kwassa Kwassa was filmed on the island of Anjouan, about seventy kilometres from Mayotte, and kwassa is the name for the small and precarious white fibreglass boats made on Anjouan to ferry people to Mayotte, a journey which has already claimed the lives of over 10,000 men, women and children. The Biennale features artists who have not been part of the institutionalised canon and who may be unfamiliar to many. An extension of the threads of African history takes us across the Middle Passage to North America and three African-American artists whose work should be far more widely seen and known. 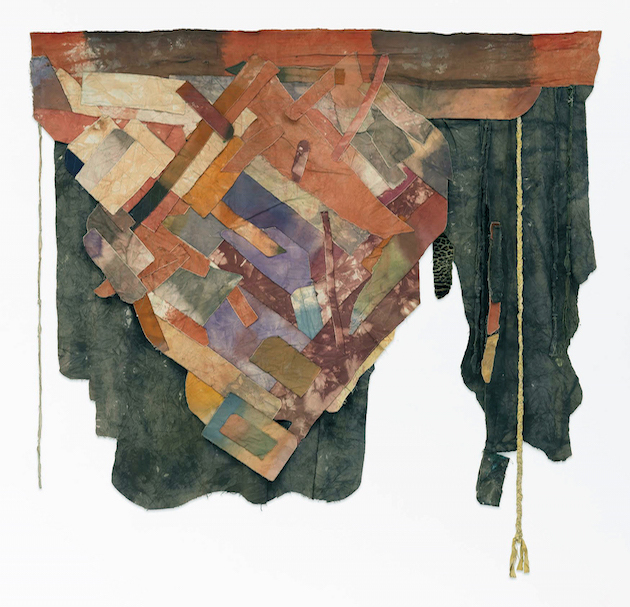 Al Loving, Sam Gilliam and Melvin Edwards are all from a generation born in the 1930s in the US’s African-American heartlands and the pre-civil rights era (Gilliam in Mississippi, Edwards in Texas, and Loving in Detroit; Gilliam and Edwards are still working, Loving died in 2005). Melvin Edwards has spent time in Africa, establishing his own studio in Dakar in 2000. 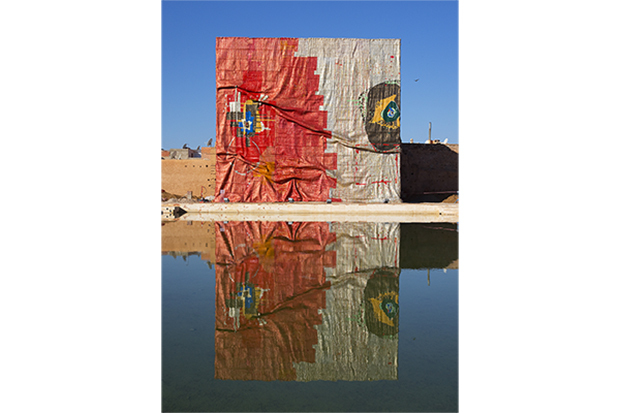 His works in Marrakech are from the ongoing series The Lynch Fragments that he began in the charged years of the 1960s. 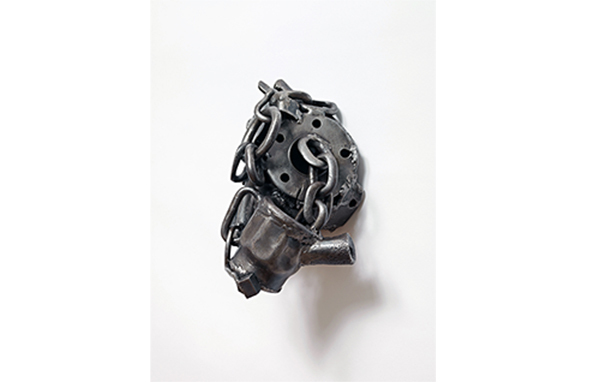 Despite their small scale, these welded metal wall-hung sculptures have a sense of menace and speak of violence without being overtly explicit. Sam Gilliam and Al Loving have both pushed the boundaries of ‘painting on canvas’ in their monumental torn, collaged and hanging works that have such presence in the zellij-tiled rooms of Marrakech’s Palais El Bahia. This is classic twentieth century Euro-American modernism seen, absorbed and understood, but then renegotiated and taken to another level. Three Moroccan artists from the same generation as Edwards, Gilliam and Loving are also given due prominence in an exhibition-within-an-exhibition (curated by Salma Lahlou and Fatima-Zahra Lakrissa) in the Palais’s rooms, their vibrant abstract work fitting surprisingly well with the carved and painted roof beams, shaped doorways and patterned tiling. These paintings and assemblages, many from the 1960s and 1970s, by Mohammed Melehi (b 1936), Mohammed Chabâa (1935–2013) and Farid Belkahia (1934–2014) signify part of the global past and the ‘other’ modernities the Biennale explores and brings firmly into the present. All three artists were associated with the Casablanca School of Fine Arts after studying, living and teaching in Morocco, Spain, France, Italy, Czechoslovakia, and the US. They were therefore more than familiar with European and American modernism, but returned to Morocco to seek ways to make their work more connected to their society and its traditions and cultures. They also taught, wrote and published, and collaborated with graphic designers, artisans and architects, and in 1969, in a radical gesture in opposition to the official spring salon, they mounted an infamous public exhibition in Marrakech’s Jemaâ el-Fna. Another example of research into Morocco’s cultural histories included in the Biennale framework is the project ‘Memory Games: Ahmed Bouanani Now’ (curated by Omar Berrada). Bouanani was a writer, artist and film-maker who died in 2011. His investigations into the relation between art and craft, writing and oral traditions, popular heritage and preservation are an important mirror on modern Moroccan cultural history. Berrada shows three of Bouanani’s own short films, and a two others with him as their subject. Berrada also invited artists (Yto Barrada, Mohssin Harraki and designer Sara Ouhaddou) to respond with works of their own in a dialogue with Bouanani and his intellectual legacy. Bouanani’s personal library is installed in the exhibition space, thus inviting people to begin their own relationship to such an archive and prompt them along a path of research and exploration. This 6th Marrakech Biennale has an astute political awareness and consciousness many institutions and institutionalised events have notably shied away from.3 Curator Reem Fadda is Palestinian and began her career working with Palestinian cultural organisations (she is currently Associate Curator of Middle Eastern art for the Guggenheim Abu Dhabi). I optimistically hope that ignoring any political dimension to cultural practice is not an option anywhere for anyone, but if Palestine is in the mix, it is unavoidable. Fadda has previously said in an interview: ‘In my vocabulary, from where I come from, I’ve never seen art that is not political. I come from a vernacular of art that was never not political…’4 The legacies of European colonisation, the processes of decolonisation, and ongoing colonial conditions can be seen in much of the work in the Biennale, but there is no neglect of the language and sensibility of aesthetics and poetics, or of intellectual and cultural integrity. As I look for threads of ideas and connections in Marrakech, there are plenty between Palestine and North Africa, and Morocco has always identified with the Palestinian cause.5 For the Biennale, in the Dar Si Said Museum’s small rooms, Khalil Rabah’s conceptual works from the 1990s are shown quietly, but insistently, near some of Mona Hatoum’s more intimate, smaller-scale works. Rabah’s subtle but understatedly powerful video and sculptural works dating from this crucial period in Palestinian history deserve more exposure. There are no direct or openly political messages, but they contain a profound (and prescient) bodily sense of displacement and discomfort. Sandi Hilal and Alessandro Petti’s The Book of Exile project links the traditions of calligraphy, book production and the dissemination of knowledge associated with Morocco, and Arab and Islamic heritage, with contemporary stories of life in refugee camps in occupied Palestine. These stories, from an ongoing project, Campus in Camps, initiated by Hilal and Petti in 2012, have been painstakingly transcribed in Moroccan Arabic script into large leather-bound books by a Marrakech calligrapher (Abdelghani Ouida). The work that is perhaps most explicitly engaged with a social and political issue that is an urgent ‘now’ has to be Khaled Malas’s Current Power in Syria (2016). Malas has previously deployed his work to look into the processes of nation-building and power generation (in all meanings of the word) in the Arab world generally, and their abject failures in the context of his home country of Syria. In a decisive act of creative and collaborative resistance, the project has created literal power in the form of a wind generator that supplies some essential electricity to the besieged communities in the Eastern Ghouta area outside Damascus. 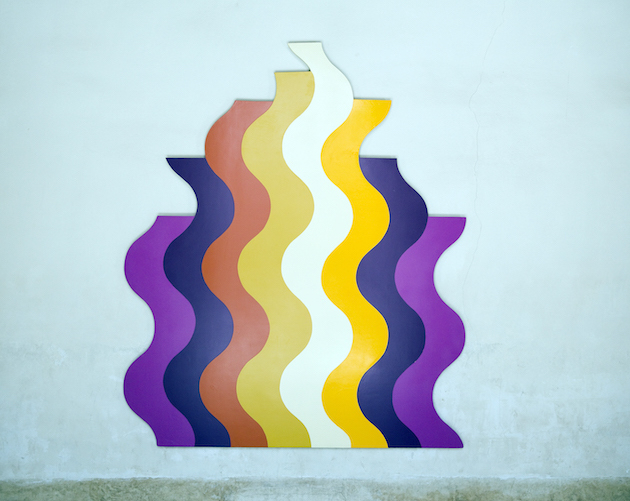 The locales of all biennales are specific to where they are and determine how and where artwork is shown. In Marrakech, the venues include old palaces with their elaborately tiled private rooms and central courtyards (Palais Bahia and Dar Si Said), the exquisite sixteenth-century pavillon in the now public Menara gardens, and the basement cisterns of the Koutoubia mosque. Marrakech is also able to offer the extensive ruins of a sixteenth-century palace. The Palais El Badii (‘the incomparable palace’) was a large and reputedly lavishly decorated sultan’s palace with pavilions, pools, courtyards and gardens. Only in use for about 100 years, it fell into disuse from the late-seventeenth century and is now one of Marrakech’s main tourist attractions. Its spacious ruins and open spaces create a dramatic setting for some of the Biennale’s larger contributions, and El Anatsui’s monumental Kindred Viewpoints glitters in the huge open central space, reflecting the sun and the light dancing off the water in the pool in front of it. No stranger to major exhibitions elsewhere in the world, the scale and folds and flows of the Ghanaian/Nigerian artist’s works belie their construction from small pieces of metal cut from consumer waste. Other ‘kindred viewpoints’ are also installed in the Palais El Badi, such as Radhika Khimji’s earth-landed parachute, ironically titled Stay Safe (a second one is in the ruins beside the Koutoubia mosque). Giving the illusion of having delivered their human weights, as the artist herself says, these parachutes claim places as sites of arrival. Voices from Morocco itself can be heard throughout the Biennale, from the artists of the Casablanca school to Khalil El Ghrib’s small sculptures of bread, string and paper – insubstantial materials that will naturally decay and disintegrate. El Ghrib lives and works in the city of his birth, Asilah, and refuses to take part in any form of commercial transactions with his work, which he views almost as a self-portrait of his own transience. Birthplaces can be arbitrary, but national identities do matter and national boundaries are of major import for those who do not have the means to cross them, and ‘Not New Now’ questions many of the assumptions that are so often made about identity and nationality. Eric van Hove, although Belgian was born in Algeria and now has a workshop in Marrakech where he collaborates with Moroccan artisans. The Biennale’s ‘living essay’ begins, it was suggested, with van Hove’s D9T (Rachel’s Tribute) (2015). At the risk of imposing too many resonances on one individual work, D9T exemplifies many of the Biennale’s themes. It is a reconstruction of the engine that powers the bulldozers used by the Israel Defence Force in its assaults on Palestinian homes. It specifically references the one that in 2003 killed the young American activist Rachel Corrie as she tried to prevent the demolition of a family’s house in Gaza. Fabricated from over forty different materials from across the world and celebrating the craft skills of Moroccan and Indonesian craftsmen in bronze, copper, marquetry, carving, ceramics and inlaid mother-of-pearl, an object of beauty is paradoxically created from the idea of one that is specifically made for violent destruction. The work calls together many of the threads in the Biennale, and, at the same time, reminds us of the need to remember, to speak truth to power and to fight injustice. But also, to respect skills and traditions, to not forget beauty, and to approach whatever we do with passion and commitment. Besides its central curated exhibition, the Biennale has an extensive programme of Parallel Projects in the form of public performances, workshops, film screenings, exhibits of work by young artists and education projects. A major programme of street art brought street artists (mostly from Europe, although ‘Karramour’ is from Morocco) to Marrakech and the coastal city of Essaouira before and during the opening days of the Biennale. 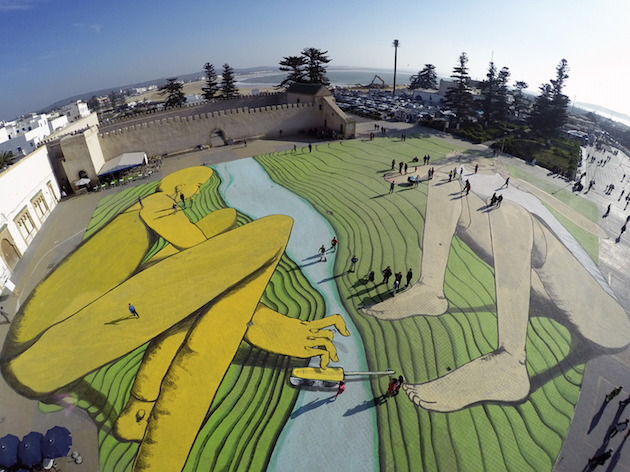 In the main square in Essaouira, the Italian street artist Giacomo Bufarini (aka RUN) produced Les Rives, a 6,400 square-metre image of two characters communicating with each other across a strip of water that can only properly be seen from an aerial view. I am not sure how involved local communities were in some of these street art projects, although there are workshops, but the bright and bold graphic interventions in the public fabric complement what are already colour-filled cities. ‘Not New Now’ is a passionate plea for a shift in considerations of art now, and particularly in the geographical and cultural spaces outside of the still-dominant Euro-American mainstream. It questions formalisms at the same time as employing a political and social compass, and an acute aesthetically sensitised one. Most importantly, it creates conversations with histories that have so often been overlooked by the Eurocentric artworld. The artworks in Marrakech’s old palace rooms and its ruins are not pre-rehearsed, rehashed and repolished, ready for the international market and exhibition circuits. There are no empty gestures transplanted from a white cube somewhere else into an exotic, foreign location. The work on show is alive, active, engaged and conscious, both of its responsibilities and its audiences. 1 This unique public space, with its food stalls, storytellers, acrobats, musicians and performing cobras and monkeys has been on UNESCO’s List of Oral and Intangible Heritage since 2001. 2 Leopold Senghor, the Senegalese socialist intellectual who was President of Senegal from 1960–1980, and the Nigerian, Nobel prize-winning author Wole Soyinka. 3 I would argue that Okwui Enwezor’s Documenta 11 in 2002 was the last major exhibition project to address such considerations with integrity and intelligence. 5 When Yasser Arafat and the PLO were expelled from Lebanon in 1982, Tunisia allowed them to set up their headquarters there and it remained their base until Arafat returned to Gaza to form the Palestinian Authority in 1994 following the Oslo Accords. In a tragic reflection of the threads and links I have tried to tease out in this review, the 2016 Marrakech Biennale is dedicated to the young French-Moroccan photographer, Leila Alaoui, who died in January 2016 following the attack on the hotel in Ouagadougou, Burkina Faso, where she was on an assignment for an Amnesty International campaign on women’s rights. 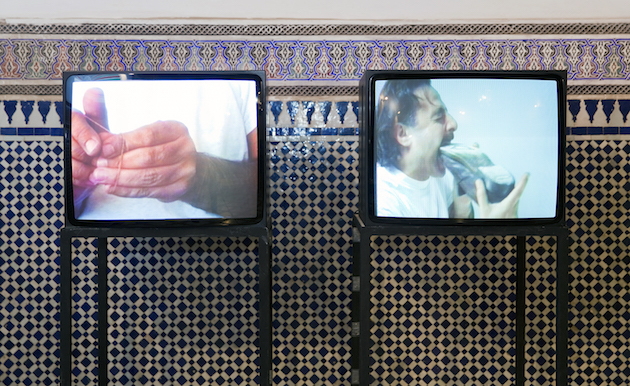 A selection of her video and photographic work is shown in one of the Biennale’s Parallel Projects in Marrakech’s Guéliz neighbourhood. The 6th Marrakech Biennale opened on 24 February and closes on 8 May 2016. The main exhibition, ‘Not New Now’, was curated by Reem Fadda and Assistant Curator Ilaria Conti. Venues are the Palais El Bahia, Palais El Badii, the Dar Si Said Museum, the cisterns of the Koutoubia mosque, the Khalid Art Gallery in the medina and Pavillon de la Menara, www.marrakechbiennale.org. The Street Art programme was curated by Vestalia Chilton of ATTOLLO, London, www.attollo-art.com.